COUNTY OVER 60s TEAM, VERY WELL DONE, PROMOTED TO THE FIRST DIVISION. SATURDAY MORNINGS,IN VIEW OF INCREASING POPULAR DEMAND,WE ARE EXTENDING THE OPENING HOURS FROM 10.00 - 12.00, AND 12.00 - 2.00. 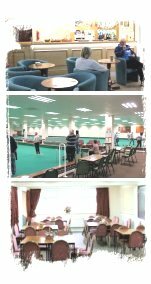 FOR MEMBERS OR NON MEMBERS, COST £2.50, BASIC TUITION, SHOES AND BOWLS ARE AVAILABLE FOR USE. IT IS RECOMMENDED THAT NON-BOWLERS COME TO THE 12.00 SESSION FOR PERSONAL HELP, THE FIRST THREE FREE SESSIONS ARE FREE OF CHARGE. CLUB COMPETITIONS: WHAT A SUCCESSFUL WEEK.WITH SOME VERY SURPRISING RESULTS. PRESENTATION EVENING: SUNDAY 5TH.MAY, 2019. 7.30 TICKETS NOW AVAILABLE, PLEASE BOOK ASAP. THANK YOU. LIVE ENTERTAINMENT, EVEN SOME OF YOUR OWN CLUB MEMBERS, HIDDEN DEPTHS. - Our sincere thanks to Mike Prestwood, Chairman, and all at Dunholme & District Indoor Bowls Club who today presented our Corporate Fundraiser, Caroline Swindin with a cheque for £736.48. The Bowls Club chose St Barnabas as their Charity of the Year because they wished to support a local good cause knowing the monies would help people in their own communities. A number of the members have seen first-hand the wonderful care their local Hospice provides as friends and family have been cared for by St Barnabas. The monies were raised through tournaments and Bowls Drives; the club are also regular supporters of St Barnabas having one of our loose change goblets on site.